And for those of you that prefer a more traditional “Remember that Song”, this song is from the last vinyl album I ever bought. Can you name the Artist and Song. Bonus if you want: Can you name the album? Question: Can you name the two Three’s Company spinoff shows? Last Question: What live-action movie character reappeared in a cartoon series battling General Warhawk’s evil organization S.A.V.A.G.E.? Rambo: The Force of Freedom debuted on April 14, 1986 as a five-part miniseries, and was renewed in September as a daily cartoon. Rambo was cancelled in December of the same year. Rambo was called in by General Trautman to lead the Force of Freedom in fighting Cobra S.A.V.A.G.E. – Specialist-Administrators of Vengeance, Anarchy and Global Extortion. There’s no truth to the rumor that instead of yelling “Yo Joe!” when attacking the enemy, they yelled “Yo Adrian!” (Oops! Wrong Sylvester Stallone franchise). Rambo: The Force of Freedom also spawned a toy line that outlasted the show itself. Last Song: “I Just Can’t Stop Loving You” by Michael Jackson. Yesterday was already 4 years ago that he died. Great job Kickin’ It Old School (@oldschool80s), Frida (@carrjam94 ) and Robert (@mishouenglish)!! President Reagan’s first few months in office was anything but uneventful. Immediately after taking office, hostages were freed from Iran. Then there was the assassination attempt. 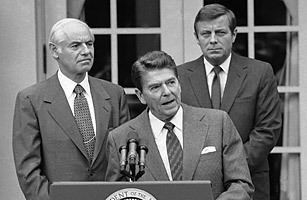 This was followed by 2 major labor strikes in the summer of ’81 – one of which, President Reagan got heavily involved in. First was the Major League Baseball strike, which began on June 12. This was the first baseball strike I remember. There had been a strike in 1972, but I was way too young to know about that one. The strike in the 1981 season was pretty significant, as it lasted almost 2 months. That’s a big chunk out of the season. However, this strike did not affect my baseball viewing to badly. The Triple-A level did not go on strike. Being from Rhode Island, I got to see the Pawtucket Red Sox more often. I enjoyed watching them more than the Boston Red Sox, so it was pretty cool that I finally got to watch the Pawtucket Red Sox on television. On July 31, 1981, a compromise was finally reached. Major League Baseball resumed on August 9 with the All-Star Game in Cleveland’s Municipal stadium. Regular season games started the next day. Since there was such a big gap in the season, a unique situation occurred. The owners decided to split the 1981 season into two halves, with the first-place teams from each half in each division (or a wild card team if the same club won both halves) meeting in a best-of-five divisional playoff series. The four survivors would then move on to the two best-of-five League Championship Series. It was the first time that Major League Baseball used a split-season format since 1892. This format ended up screwing the Cincinnati Reds (National League West) and St. Louis Cardinals (National League East) as each failed to make the playoffs. This was despite the fact that they had the two best full-season records in the National League that season (and would have won their divisions under normal circumstances). St. Louis made up for it the next season by going on to win the 1982 World Series. In the first round, the New York Yankees beat the Milwaukee Brewers (3 games to 2), the Oakland Athletics swept the Kansas City Royals (3 games to 0), the Montreal Expos beat the Philadelphia Phillies (3 games to 2), and the Los Angeles Dodgers beat the Houston Astros (3 games to 2). In the League Championships, the Yankees swept the A’s (3 games to 0), and The Dodgers beat the Expos (3 games to 2). And then the Dodgers won the World Series by beating the Yankees 4 games to 2. As the Major League Baseball strike was coming to a conclusion, another one was starting up. Question: What live-action movie character reappeared in a cartoon series battling General Warhawk’s evil organization S.A.V.A.G.E.? Last Question: What group performed the theme song to Square Pegs? Also, check out this interview Kickin’ it Old School had with The Waitresses’ Chris Butler. It’s a really good one. Great job Frida (@carrjam94 )!! Question: What group performed the theme song to Square Pegs? Last Question: What movie is this from? Question: What movie is this from? Last Question: On The Cosby Show, what was Clair Huxtable’s maiden name? Hanks is also the maiden name of Bill Cosbny’s real wife, Camille.